Nasson staff show their colors on National Mammography Day – York County Community Action Corp. Breast cancer doesn’t actually have one day of recognition; it has the entire month of October. However, National Mammography Day, on the third Friday in October, is a good date to celebrate as Breast Cancer Awareness Day. On this day, women are reminded that regular checkups as advised by their physician are key to early detection of breast cancer. 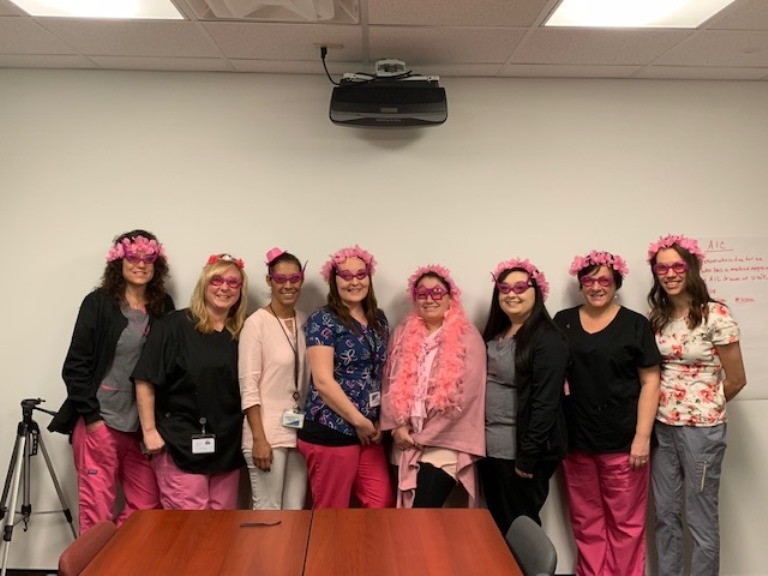 Staff from Nasson Health Care, decked out in pink scrubs and floral garlands, are doing their part to support this important campaign. They are: (l-r): Katrina Howgate, Laurie Lord, Catalina Lanigan, Brittany Bailey, Leah Young, Madison Selfridge, Rebecca Gaillard, and Sara Shaw.